During the day there are plenty of activities on the beach like swimming, surfing, volleyball and football but there is plenty of fun to be had in the neighborhoods around the beach. On a cloudy day, head over to Avenida Atlantica for some of the most haute couture beach clothing boutiques. Or go one street over for more affordable and diverse stores and shops. Visit the Portuguese forts at either end of the beach and take a step back in time. At night the restaurants, bars and dance clubs are always hopping. A great restaurant with reasonable prices is Restaurant Shirley. Located on Rua Gustavo Sampaio it is known for its seafood and is a favorite of the locals. One of the more sophisticated bars near Copacabana beach is the Piano Bar at the Copacabana Palace Hotel. Very romantic and cozy, this is the perfect place to start a romantic evening. At Ipanema Beach you can enjoy the water but get off the crowded beach by booking a cruise on one of the Jangadas or sailboats or try your hand at para sailing. There are bicycles for rent and a bike path along the length of the beach. Considered the artsy section of the city, there are plenty of art galleries and avant-garde movie theaters as well as Internet cafes and upscale bookshops. At night walk around Praca da Nossa Senhora da Paz, Baixo Quiteria and Baixo Farme to enjoy some of the bars, restaurants dance clubs and free live concerts.There are many other beaches in the area to enjoy. 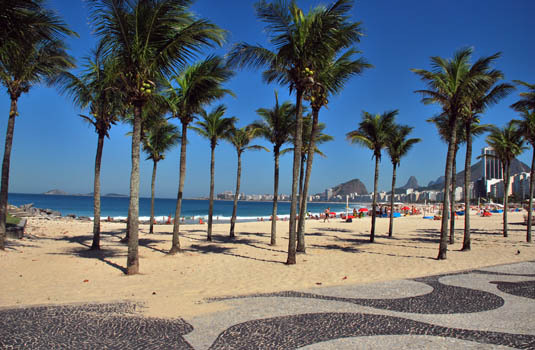 Leblon Beach, next to Ipanema Beach has a lovely little shopping area along Av. Ataulfo de Paiva and Rua Dias Ferreira. Here the visitor can find boutiques for souvenirs, bookstores and quaint cafes. After some surfing or body boarding on Barra beach grab a great steak at Barra Grill. It is a Churrascaria-rodizio and prices are medium to expensive. The Barra neighborhood also has some of the best shopping malls including New York City Center, BarraShopping and Citta America all located on Americas Avenue.